By day, the expansive plaza in front of Oslo’s City Hall teems with people, especially in the summer months when days are longer. June 2014, panorama from 4 vertical images, additional exposures for highlights, focal length 16mm, aperture f/11, shutter speed 0.6 second, ISO 100, tripod. There are tourists here, many of whom come to the area to catch the ferries to the fjords. But there are locals as well, families with children who’ve come to enjoy the sunshine in Radhusplassen. With so much happening in the square, at least in the daylight hours, it’s hard to imagine that the busy plaza was once part of one of the city’s main motorways. 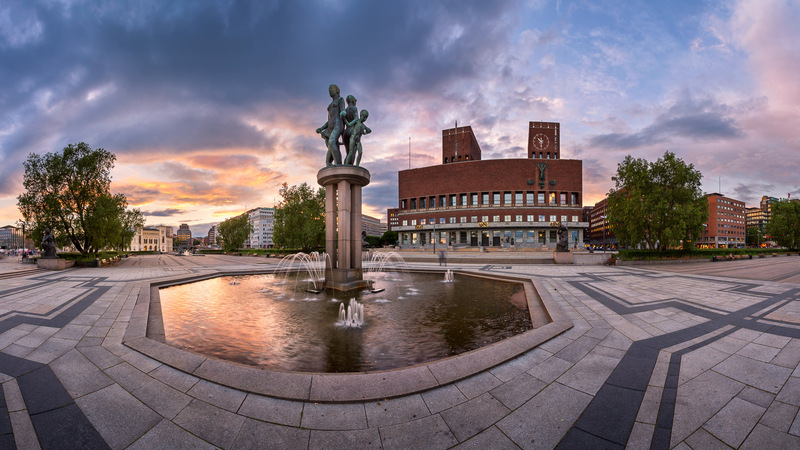 Radhusplassen is dominated, of course, by the strikingly modernist City Hall, its twin towers instantly recognizable on Oslo’s skyline. Equally emblematic are the statues adorning the square, their classical forms in sharp contrast to the severe functionalist structure overlooking them. I came back to the plaza at dusk, when the crowds had mostly thinned. It was the end of a cloudy day, the kind of day that promises a spectacular sunset. It didn’t disappoint. To capture the vastness of the square, I used a panoramic technique. I wanted the viewer to experience something of what I experienced — the beauty of the sunset, the contrast of modernist architecture and classical sculpture, and the vastness of Radhusplassen.